STRICT rules preventing police from continuing pursuits across the Irish border have allowed suspects to escape on over 40 occasions in the last five years. Detail Data found that 47 police chases were terminated at the border between 2011 and 2015, with all but three related to pursuits from north to south. Figures obtained from the Police Service of Northern Ireland (PSNI) under Freedom of Information legislation revealed that 12 arrests were made in relation to six of the pursuits, meaning that in 41 of the incidents the suspects escaped. The information is released as governments debate how best to address the management of the Irish border in the wake of the Brexit referendum result which will see the UK leave the European Union. The figures do not take into account incidents where suspects fled before an active police chase was launched or where suspects crossed the border on foot. An Garda Síochána said it did not hold data in relation to the number of border ‘hot pursuits’ they had been involved in. However, the PSNI provided information relating to three incidents in which Gardaí had contacted it to alert them about suspects escaping north. The term ‘hot pursuit’ is used to describe an incident where a suspect, being pursued by a police force, attempts to escape by crossing a border into another jurisdiction. The two police services indicated that they work closely and that each has the authority to arrest suspects fleeing from one jurisdiction to the other, though this does not go as far as procedures elsewhere in the European Union where police can continue pursuits across borders. Stormont’s Department of Justice said a Cross Border Policing Strategy dating from 2010 “is currently under review", but that there are no immediate plans to legislate for the hot pursuit of suspects at the border. A spokesperson for the Northern Ireland Policing Board added that the matter had not been brought to its attention by PSNI Chief Constable George Hamilton. 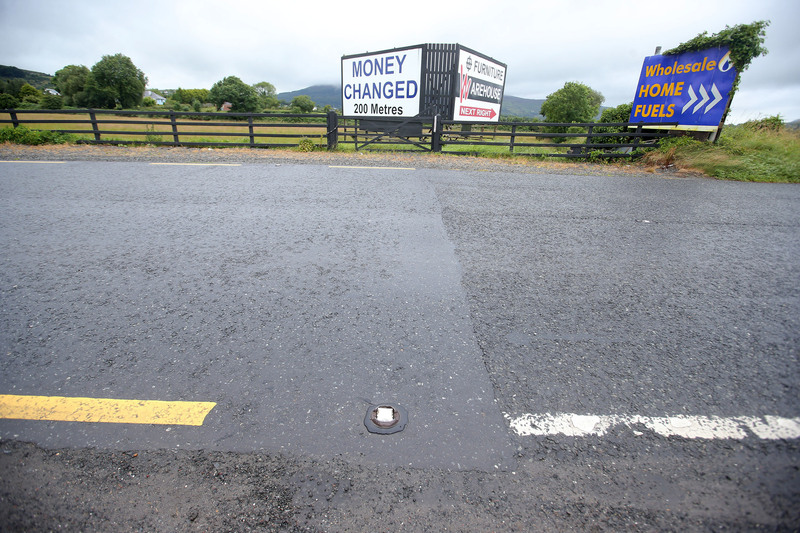 The Irish border is roughly 310 miles long and has in the region of 200 road crossings. A number of roads cross the border multiple times in a short distance. 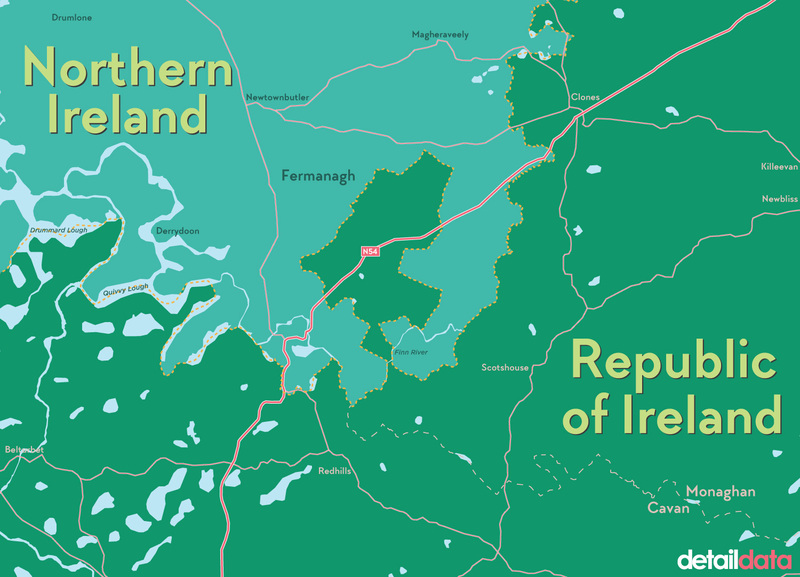 For example, Drummully Polyp in County Monaghan is a 3x2 mile section of the Irish republic which is almost completely surrounded by Co Fermanagh and effectively cut-off from the south by the Finn River. It is only accessible through Northern Ireland on roads such as the N54/A3, which crosses the border four times in a six mile stretch. Another example is the N53/A37 Dundalk to Castleblayney road, which enters and leaves south Armagh on either side of Cullaville. Despite such interweaving of infrastructure, police on both sides of the border confirmed that they cannot maintain pursuit once a suspect crosses the border. Stormont’s Department of Justice (DOJ) told Detail Data that previous proposals to allow hot pursuit were not approved by the London and Dublin governments. “The Schengen Convention supplements the provisions of the Strasbourg Convention,” the DOJ statement read. “Article 41 of the Schengen Convention, which is not a devolved matter, provides for hot pursuit by police from one state into another. This provision does not apply to the border between Northern Ireland and the Republic of Ireland as neither the United Kingdom nor the Republic of Ireland signed up to Article 41. However, the hot pursuit data provided by the PSNI suggests that such a facility has not been used in the past five years with each of the 47 pursuits stopping at the border and the neighbouring force notified. The majority of incidents took place in the Derry-Donegal (18) and Newry-Dundalk (8) regions. Other crossing points included Middletown-Monaghan, Strabane-Lifford, Newtownbutler-Clones, Aughnacloy-Emyvale and Crossmaglen-Dundalk. The prevalence of such incidents has spiked at certain times – notably between December 2011 and February 2012 - when 13 incidents were recorded in a 62 day period. The data also highlights where multiple incidents have taken place in the same area on the same day. February 11, 2012, saw two chases from the Cloughogue area of Newry; February 23 in the same year saw two chases from the Coshquin area of Derry/Londonderry and on July 25 in 2013 there were two chases from the Crossmaglen area. To view all of the data issued by the PSNI click here to visit our datastore. In its response An Garda Síochána said it did not hold information on hot pursuits. “No such statistics are available, however the Criminal Law (Jurisdiction) Act 1976 allows for persons who have committed an offence in Northern Ireland to be arrested if they flee into our jurisdiction and the same applies with the PSNI,” a Garda spokesperson responded. The PSNI data reveals that just 12 arrests were made in relation to six of the pursuits. The PSNI data does not reveal why individuals were being chased or details of any subsequent charges and convictions. Detail Data asked Stormont’s Department of Justice if it was currently considering the issue of hot pursuit. “The PSNI and An Garda Síochána have an excellent working relationship which provides a firm basis for practical and strategic co-operation between both services, including in emergency situations such as a hot pursuit," a DOJ spokesperson responded. DOJ has since clarified that the updated strategy “is currently under review”, with no exact timeframe at present for its publication. The existing strategy, which was published in 2010, makes no direct reference to hot pursuit, but does discuss areas relating to cross border investigations and operations including the ‘interoperability’ of radio systems; the sharing of information; and the establishment of a joint tasking and co-ordination group as well as emergency planning. An Garda Síochána said they did not hold data in relation to the number of border ‘hot pursuits’ they had been involved in. However, the PSNI provided information relating to three incidents in which Gardaí had contacted them to alert them about suspects escaping north. The term ‘hot pursuit’ is used to exemplify an incident where a suspect, being pursued by a police force, attempts to escape by crossing a border into another jurisdiction.